EEEK! Another Bakeshop project! I'm super excited for this one to finally come out today! It's been finished for a while and I'm not so good at keep my mouth shut so it was hard not to show it! Hope you guys like it! If you're visiting from Bakeshop, hi! I'll entertain you a bit with what happened to me yesterday (early) morning. Tropical Storm Lee is blowing through my area and the power went out at 5:15 AM. My kiddos sleep with a sound machine on so not 30 seconds after the power goes out, my eldest wakes up crying about his sounds. I tell him to go ahead and get in bed with me since I know he won't go back to sleep alone and "soundless." Not a minute after we lay down then I hear one of the dogs get up and walk around....then I hear an ominous wet sound. She has peed all over the carpet! Lovely. I fumble around for some matches and a candle so I can see what I'm doing, then I grab the cleaner and some paper towels to clean the mess. As a side note, my dog is almost 14, so I excuse these occasional accidents. While I'm cleaning, I notice the cleaner smells funny. I hold the candle down to the bottle and realize I've just cleaned my carpet with vinyl/leather CAR cleaner. Cripes! Oh well. I just sprayed some Fabreeze over it and went back to bed.....only to hear the incessant beeping of both the house alarm and fire alarm, which want me to know they don't have electricity, but their batteries are sure working! Finally, the oldest munchkin and I fall asleep. We are woken up at 730 by the power coming back on and my youngest's sound machine blaring the default sound. Now, the sound they sleep to is rain, but the default sound (what it plays when you first plug it in or after a power surge) is FREAKING BIRDS! Who in their right mind finds crazy rainforest bird chirping restful? So, of course, it wakes both kids up. I blearily look over at my eldest laying next to me--he then proceeds to lift his legs and booty in the air and POOT THREE TIMES. Good morning, Mama! Oh, have a mentioned that my husband if off at a Bachelor Party in the Catkills for the entire weekend? Or that it's my 7 year wedding anniversary? Yeah. Happy Anniversary to me! What a weekend!Hope things have calmed down for you now. 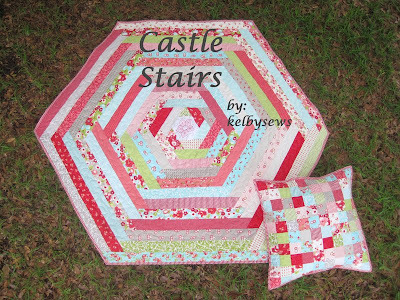 Your hexie quilt is super - I am a bit of a hexie freak at the moment so loved its look right away. Ha! With a morning like that, the day could only get better...right? Love your Bake Shop project! I'm off to check out the tutorial. great MBS project Kelly. never a dull moments for you, huh? i remember when my daughter was younger she would fall asleep in the stroller, but the nano second i stopped walking, she woke up. grrr, so even stop signs etc, i would move her back and forth!! Awww Happy Anniversary! Good thing you guys had that wonderful trip west a little while ago! Did the leather cleaner mess up the carpet, or did it work out alright? Oh my gosh! I'm sorry but I had to laugh. Hopefully you made it through that with your sanity and hubby will be giving you an amazing anniversary surprise. LOL Happy Anniversary to you both. I had to come over to tell you how awesome your quilt was at MBS. I LOVE this one. i loved your story! what a great night! we use sound machines for our kiddos too. we call them our "miami sound machines" and my daughter loves the bird sound... in her defense it is not the crazy jungle birds... it is the sweet neighborhood birds... ;) super congrats on the bake shop. Happy Anniversary! Sorry to hear about your "adventure."